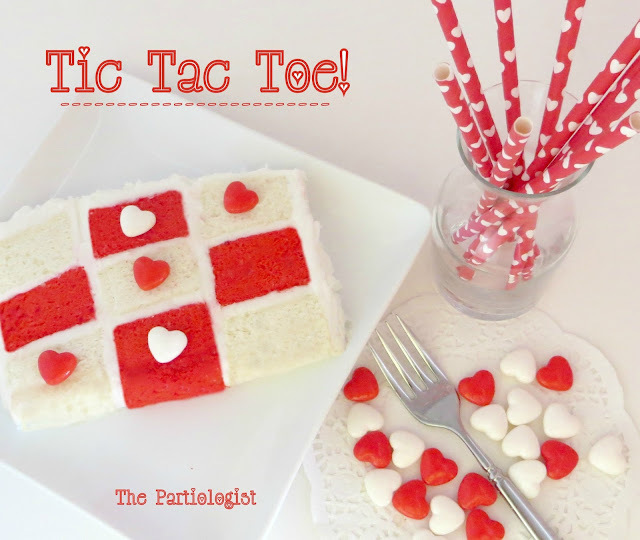 The Partiologist: Valentine Tic Tac Toe Cake! Valentine Tic Tac Toe Cake! Why not serve a chance at love in every slice of cake this Valentine's Day? 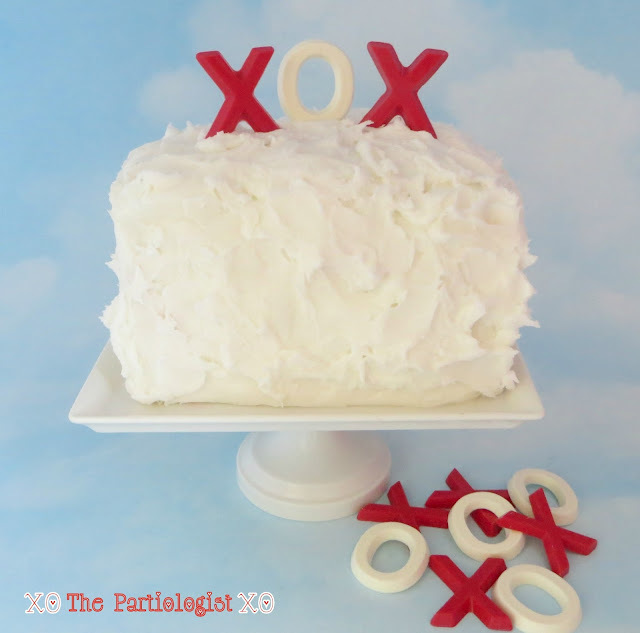 Okay, maybe you'll win at Tic Tac Toe and get to eat a big 'ol piece of cake...That's what I call that LOVE! You'll have a chance to win in every slice! It's love on a cloud! Choose a white cake mix. Use the egg white recipe so it stays WHITE! Mix it according to directions. Grease and flour (or Bakers Joy) two 8" x 8" pan. Pour half of the white batter into one 8" x 8" pan. Color the remaining half of the batter red and pour the red batter into the other 8" x" pan. Place a sheet of wax paper over the cooled cakes. Lay a cookie sheet on top of the wax paper, hold on to the cookie sheet and cake pan and flip over. Cover with saran wrap and FREEZE overnight! Now that the cakes are frozen, they will be easier to cut. Trim the dark edges off the white cake. I've marked on the cake photo where you will need to cut the cake. First, trim the edges off the red cake and cut into five strips. Freeze the pieces until you need them. Find a plate which you will display your game cake. Fill a pastry bag with buttercream frosting fitted with a JUMBO basket weave tip. Lay the first slice of cake on your cake plate and pipe a large strip of frosting across. (I found if you pipe your frosting, you don't get crumbs from spreading). 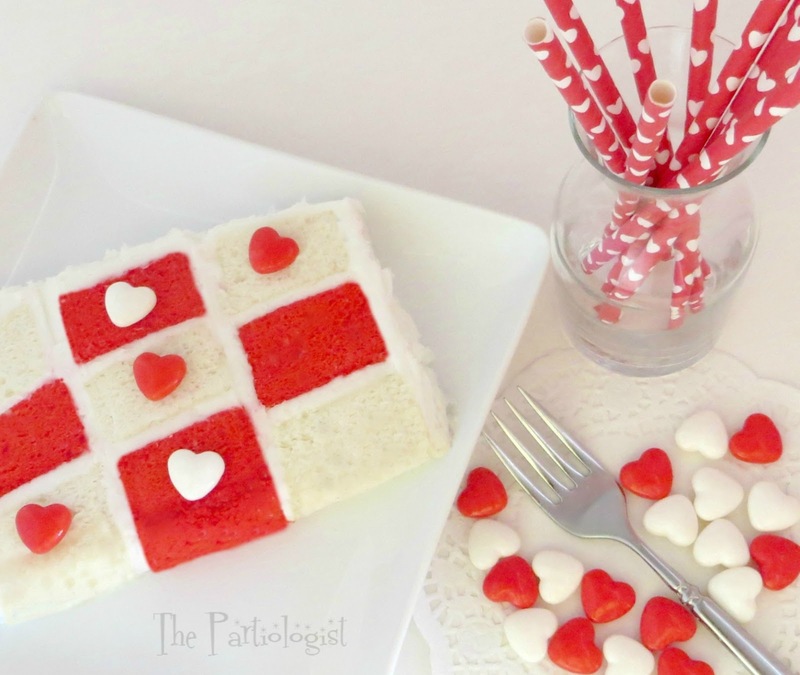 Continue building your tick tac toe board, layering with frosting between each slice of cake. Once the cake is completely covered, using an offset spatula, make peeks over the entire cake. Top with chocolate X and O's. My plan was to use the chocolate X's and O's for playing pieces. Only, once I cut into the cake, I realized they were too large, so I went with candy hearts! Perfect - Looks like I won! Quit playing games with my heart! You always win! 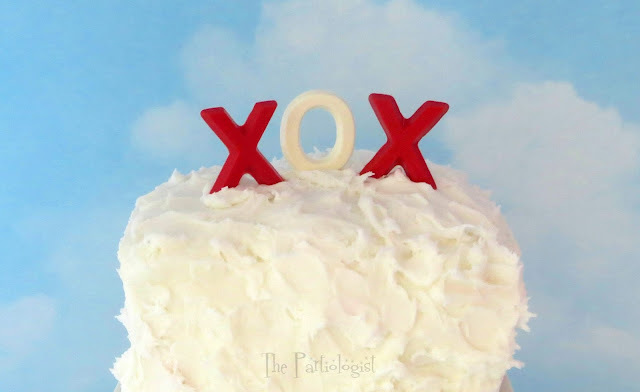 This is such a fun cake idea for Valentine's Day, and so easy to make. Anyone who sees this gorgeous cake is a winner! I am totally on cloud 9 with this cake! BEAUTIFUL!!! Aww, now that's another idea - a cloud 9 cake!! Thanks Lisa! Such a fun cake!! Looks yummy, too! Yes, I think you could do it!!! This cake is adorable...I want a piece right now!!!! This LOOKS so fantastic! Awesome, Kim! Gorgeous and fun, too! What an awesome idea! It would be fun to slice into the cake and surprise your guests, wouldn't it? Such a cute cake. Love when my piece of cake can also be challenging (to play that is). You had me going for a minute though. I thought the picture of the completed cake looked like it was round and I couldn't figure out how you got the checkerboard on a round cake..?? Then I had my coffee and saw that it probably was not round in reality...camera foolery maybe? Love all you do....I'm looking forward to Easter 2014 ideas. I had so many compliments on the jelly-bean glasses....so original and now so copied...and so easy.